Brian took Rosie for a walk today. Well, sort of. Rosie is a cat. Cats don’t get walked. They get tethered. And once you tether them, you better be prepared for the cat to make the rules. Cats always make the rules, but it is only when you leash them and try to make them act like something that they are not that you begin to realize finally that they are not dogs or weasels or horses. They are cats. They live by their own rules. Today, however, she seemed more enchanted by the outdoors than usual and rather than sit contentedly on Brian’s lap while nature came to her, she decided to investigate nature. This meant an attempted leap off the porch. The only thing stopping her was my hand on her tail and Brian’s hand at her collar. That’s when I suggested he leash her. We tried using a harness once, but she bucked it like a wild horse bucks a saddle. She leapt up and down throughout the living room and kitchen, toppling guitars and chairs before I had the presence of mind to grab her by the back of her neck like a mother cat grabs a kitten while Brian unbuckled the harness. So Rosie sat there on the porch peering at her green leash while Brian waited at the bottom of the stairs. It was there that I remembered a story I read – the only story I remember, really, and not even a story at that – about Shelley Manne, the drummer. Manne was a great drummer who began during the big band era. I still remember my first sight of him on a DVD of jazz drummers. He sat on a riser above the band behind a white drum kit with a bass drum the size of a coffee table. He had a solo. The bandleader signaled him, but instead of a flashy Buddy Rich solo, the kind I had been accustomed to seeing, Manne did something subtle instead. A quick roll. A swinging beat on the hi-hat, and then without hesitation he moved to the floor tom and changed to a slower tempo but it still swung. You could hear all the beats even when he wasn’t playing them. Wow. And he was cute, too. What’s that guy’s name?” I asked Brian who was holding the remote. Be still my heart. Shelley Manne. Where are you? Turns out, he’s dead. Long since. A quick Wikipedia search told me he had died. That was all I really learned aside from the usual listing of recordings and famous appearances and friendships with other musicians. But that’s not what I wanted to know. I wanted to know some story, see some picture of the musician that would help me see what kind of person he could have been. A few weeks later I ordered a book about him from the library. In the dim light of my library carrel I skimmed over the names of records and appearances and then I read an anecdote about where he grew up. His father was a music director in New York City and young Shelley, perhaps no more than 7 or 8, would walk his cat on a leash through Central Park. Walk his cat on leash through Central Park. That’s what I needed. Every time I see him play or even think of him playing I see that picture of him in my head – a young boy in short pants, a boat under his arm, walking toward the pond in Central Park with a cat on a leash. A cat that undoubtedly would stop and sit and pluck at his leash rather than walk. So this morning, while I watched Rosie chew on her green leash and while I watched Brian wait patiently for her to notice him and not the leash, I saw in my mind a young Shelley Manne, seven years from his first drum set, try to walk a cat through Central Park. It’s these odd pictures years apart in different cities and lifetimes, but which are remarkably similar that remind that we are all the same and that once Shelley Manne, just like me, had to learn to play triplets, or hold his sticks properly, or accentuate a beat, or come in from a break. That’s why stories about famous people are so comforting to us. 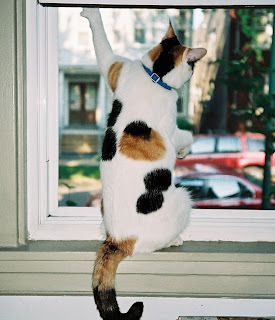 We realize that’s once they were just like us – just like us trying to walk a cat on a leash. Hoooeeeiii, rasslin’ a cat on a leash is fun. If by fun you mean the dangerous, recklass, look-ma-no-hands sort of fun. My roommate and I tried that when we first got our cat. And then she became deathly afraid of things above her – her fear of ceiling fans transfered to satellite dishes attached to walls on our apartment complex. 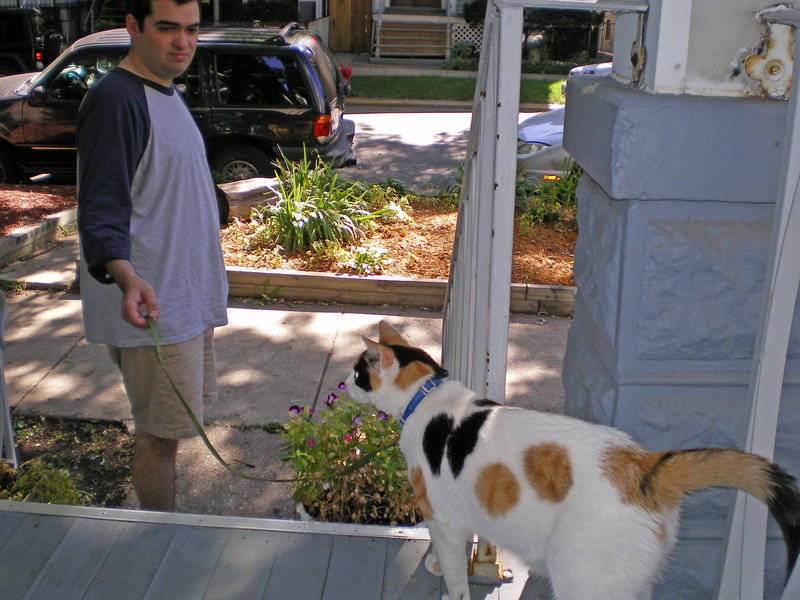 I remember fondly, since I was holding the leash and not the cat, how she looked around, flatted her ears, and climbed my roommate. His clothing flirts with the idea of danger, if not him, and his leather jacket still has the marks.